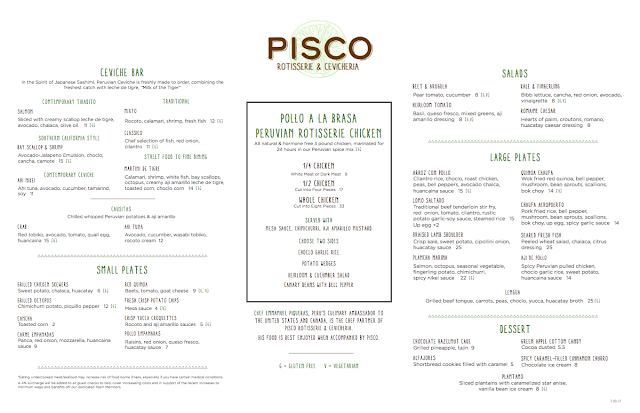 Set to open this Thursday, July 27 in the former Sammy's Woodfired Pizza space in Point Loma's Liberty Station is Pisco Rotisserie & Cevicheria, a dinner-only modern Peruvian restaurant and cocktail bar helmed by famed Peru-native chef Emmanuel Piqueras. 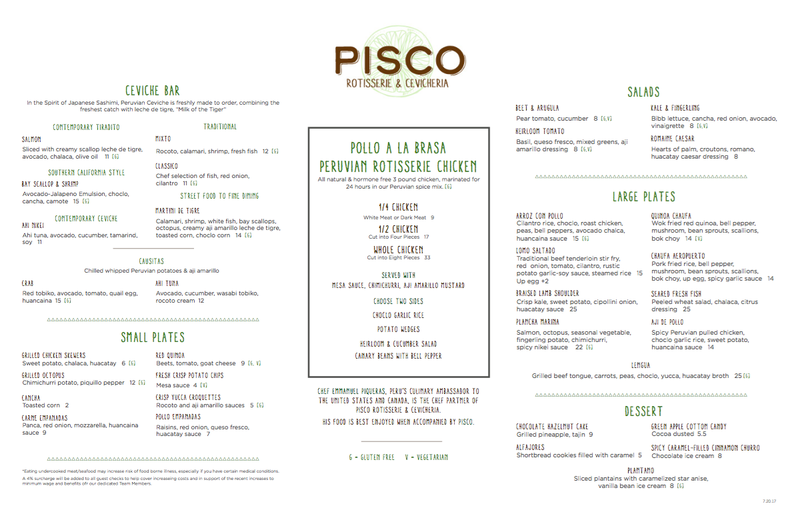 A partnership between Chef Piqueras, a culinary ambassador to Peru, and Sammy's owner Sami Ladeki, Pisco Rotisserie will offer a food menu centered around pollo a la brasa rotisserie chicken and Peruvian-style ceviche. The open kichen will have a 12-chicken rotisserie that will spin out 24-hour marinated whole birds available in quarter, half and full orders. Six ceviche options will be made to order to ensure freshness, and a dedicated wok station will be used to prepare the Chinese-influenced dishes of Peru, like the Chaufa Aeropuerto pork fried rice with bell pepper, mushroom, bean sprouts, scallions, bok choy, egg, and spicy garlic sauce. The namesake Pisco distilled grape spirit will be featured in a variety of ways behind the bar. Expect a variety of Pisco sour cocktails like a prickly pear version, as well as more modern cocktails like the Machu Peachu with house-infused rosemary Pisco, peach liqueur, lime juice and white cranberry peach juice. 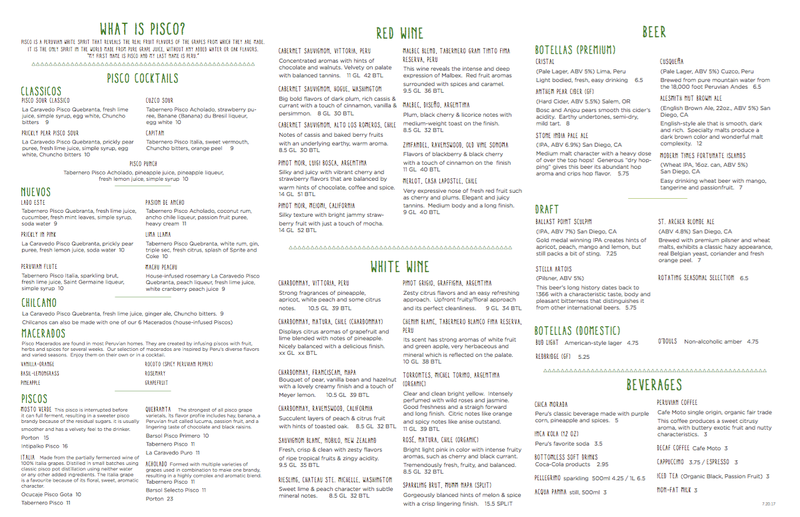 The restaurant will also offer infused-fruit piscos, as well as wines available by the glass and bottle, including South American varieties, and beer on draft and in bottle. To celebrate the grand opening and Peru's Independence Day, Pisco will host a Fiestas Patrias party on Friday, July 28, with special guests, Pisco cocktails and Peruvian delicacies. 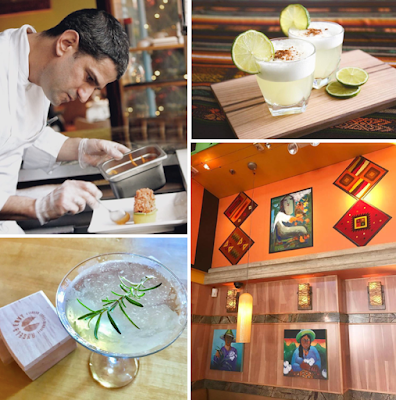 Pisco Rotisserie & Cevicheria is located at 2401 Truxtun Road, Suite 102, in San Diego's Liberty Station. For more information, visit piscorotisserie.com and check out the menus below.